Why settle for cloudy skies this summer when you can upgrade your staycation to a sun-soaked, action-packed, European culture-trip of a lifetime? The best part? It’s all just a drive away. 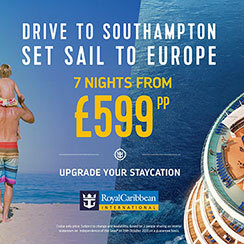 Drive to Southampton and set sail to Europe for 7 nights from £599pp. Go on, swap muddy boots for scuba suits. This is how to holiday. 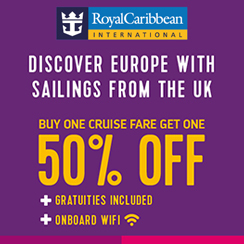 Hop aboard and enjoy all of the fun together, because when you buy one cruise fare, Royal Caribbean will give you another 50% off. Plus Wi-Fi… perfect for holiday bragging! Also, sailings from the UK included gratuities. You can enjoy all of these great offers when you book before 6th May 2019. When it comes to innovation, Royal Caribbean excels above and beyond any other cruise line. Each family-friendly vessel comes complete with a range of dazzling amenities including colourful waterslides, bumper cars, ice-skating rinks, trampoline parks, surfing simulators, rock-climbing walls and much more. 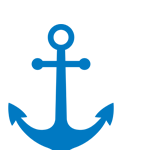 You can also enjoy a fabulous range of dining options, with every taste you can think of being offered on board. This is a holiday experience that you and your family will never forget. The chefs will take guests around the world with an incredible choice of complimentary and speciality dining options. From sushi to tapas, spicy Mexican to five-course gourmet meals, guests’ taste buds will be thoroughly tantalised. They can be as healthy or as indulgent, or as formal or informal as they like. Dance to live music, enjoy brilliant stand-up comedy, take in a spectacular West End-style show, be amazed by the latest film release in 3-D or watch heart-stopping aerial acrobatics in the AquaTheatre. There’s never a dull moment on a Royal Caribbean holiday. Thrilling activities Fancy surfing the waves on the top deck? No problem. For those keen to try rock climbing or ice skating? Be our guest. Tempted to enjoy a pampering session at the Spa? Go on, spoil yourself! With so many innovative activities to choose from, passengers will never be stuck for something to do. From lavishly appointed two-story suites to balcony rooms for two, every one of the rooms has been designed with comfort in mind. With cool linens, heavenly mattresses, stunning ocean views and dedicated attendants, they’re a pleasure to relax in after a busy day. Take on the family at mini golf, splash around in the H20 water park, then meet your favourite DreamWorks characters. There is even an award-winning complimentary kids clubs. Spending time together has never been so rewarding! Royal Caribbean have everything guests need for an unforgettable holiday all included in the price. Rock-climbing, FlowRider, West End-style theatre shows, mini golf, the zip line, ice skating, the H20 Zone water park and so much more.